While most pet lizards and turtles require regular vitamin supplementation, the majority of rodent- or bird-fed captive snakes rarely need additional vitamins. By feeding gut-loaded rodents or other prey, you'll benefit your snake with the nutritional value of the prey animal plus the contents of the prey animal's stomach. However, a few exceptions exist, as some dietary items can cause long-term nutritional deficiencies. Solicit your veterinarian’s advice about a supplementation regimen if your snake primarily eats fish, insects or worms. Many snakes eat vertebrates such as rodents. In doing so, they benefit nutritionally from not only the muscle of the prey but also the bones, viscera and stomach contents. The fruits, vegetables and grains in the guts of their prey help snakes to obtain vitamins they wouldn't get otherwise. Additionally, the calcium in the bones helps to balance the phosphorus in the muscle tissue, allowing snakes to maintain an appropriate ratio of the two minerals in their bloodstream. This helps snakes to avoid the nutritional deficiencies that plague herbivorous or insectivorous lizards and turtles, whose diets are often high in phosphorus and low in calcium. Gut loading is the process of feeding your snake's prey foods a high-quality diet before offering the prey to him. Fortified lab chow, assorted fruits, nuts and seeds are all important gut-loading items. Often, hobbyists purchase pre-killed, frozen rodents for feeding snakes; with these, it is important to determine what the rodents were fed prior to euthanasia. The same principles apply if your snake prefers lizards, frogs, birds or insects for food: Feed -- or ensure that they were fed -- a well-rounded, high-quality diet before offering them to your snake. While most snakes do not require supplemental vitamins, it is important to consult your veterinarian if the pet exhibits any signs of illness. Some vitamin deficiencies cause serious and potentially life-threatening problems, but you should never begin a vitamin regimen without soliciting your vet’s input. Your veterinarian will review your husbandry and your snake’s natural history, perform a physical examination and probably draw blood to determine whether the captive creature needs supplemental vitamins. 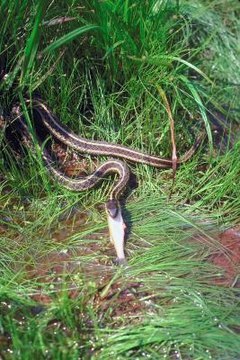 Some snakes consume prey that may cause nutritional deficiencies over time. Some invertebrates are high in phosphorus and low in calcium, for instance, while fish can make snakes deficient in vitamin E and thiamine. To address this issue, consult your veterinarian to develop prudent supplementation schedules. Vitamins may be appropriate for snakes who eat only newborn rodents, which lack hard bones and are high in fat. A lifelong diet of newborn rodents may cause calcium deficiencies and obesity. Feeding a wide variety of foods to those who will accept them will help ensure that nutritional deficiencies don’t develop.